Trail cameras have been used since the 1990s to capture video and snapshots of wild animals in remote areas. The videos and images are stored in a memory card for future use. Some cameras have wireless connectivity which enables you to save the images remotely or even view the images in real-time. These cameras have a waterproof casing to stop water and moisture from reaching the electrical components. They also come with additional accessories for fastening the camera on a tree or a post. These cameras use infrared technologies to work in the dark. The camera models vary in terms of size, battery life, settings, and color. High-quality models have a camouflage casing to prevent the animals from noticing a new object in their habitat. The battery life can vary from a few minutes to several days depending on the settings. Some models have powerful external batteries to minimize the number of times you replace the batteries. When it comes to settings, the cameras have several modes. You can set the camera to take snapshots or video after every few seconds or when an animal is detected in the vicinity. Some models can be configured to send you images via email when there is an animal activity near the camera. The picture and video quality that you select determines and the length of the video and the number of photos that you can take before the memory becomes full. The latest models of trail cameras record a timestamp, moon phase, geographic coordinates, temperature and other important metadata on each photo. Most wild animals are nocturnal. This means that they are active at night. Most animals also have a strong sense of smell which enables them to detect a human being or a predator from a distance. Others have sensitive ears and other senses which enable them to hear slight movements and vibrations. Some have better eyesight and they can see you before you see them. Another important thing is that almost all wild animals have skins and hides that offer maximum camouflage in their natural habitat. These characteristics make it difficult for a researcher to study the behavior of some animals. Hunters also find it difficult to locate, trap and kill these animals for game meat. Early man used to hide in a location with crude weapons and wait for hours before attempting to kill a wild animal for meat. This was a difficult task since there were many dangerous animals in the jungle. After suffering and enduring for a long period of time, Man managed design sophisticated hunting weapons. With the weapons, there was no need to hide and wait in the cold for long hours to kill an animal. The weapons could simply kill an animal from a distance. However, population increase led to overexploitation of wildlife. This led to the extinction of some species of animals. Nowadays, there is a small population of wildlife in game parks, reserves, and other protected habitats. Therefore, you need to visit the authorities and acquire papers before harvesting specific animals. However, the low population of wild animals makes it difficult to spot a target animal. Another problem is that animals have also evolved and they know a man is dangerous. Once they detect your odor, they either hide or run away. This problem makes it difficult for someone to successfully hunt an animal using a gun or bow and arrow technique. The advent of a trail camera has made it easier for researchers and hunters to know how animals behave in the wilderness. You can position the camera on a trail, water source, or the field to monitor the activities of the animals. If you are a hunter, a trail camera can enable you to understand the time which an animal eats, moves or sleep. With this information, you can easily lay your trap or position yourself with a gun in a strategic position and target the animal. However, you should seek for a hunting license and only use acceptable gun models and traps to avoid violating the law. Don’t hunt endangered species of animals since they can become extinct. Furthermore, you can get arrested for poaching which can lead to heavy fines, long jail terms or both. Latest trail cameras are available in many online stores. The best game camera available for the money should be able to record moon phase, temperature, timestamp and detect animal movement using infrared technology. The gadget should also have long battery life and offer wireless connectivity so that you can access your photos remotely on a laptop or smartphone. The nocturnal nature of most wild animals makes it safer to walk in the forest during the daytime. The animals that you target might not be at the place you want to mount your camera during the daytime. Daylight allows you to set up your camera with high accuracy and caution. You are also able to predict the possible dangers to your life or your camera. Avoid checking the camera from time to time since the animal will learn your pattern and change its location. Some sensitive animals will come to investigate the site after you leave. If they detect strange objects or your odor, they will never move closer to your camera. It is recommended that you mount a trail camera using gloves to avoid leaving your odor on the gadget. Also apply a special spray that eliminates any other strange scent or odors. Some people apply the target animal’s urine or poop on the casing of the camera so that it doesn’t sense any danger. Forests have bears, lions, elephants, leopards, buffaloes, pythons and other deadly animals. Some insects such as some species of spiders can kill you in minutes. Don’t forget that there are some poisonous snakes such as cobras in the forest. All these animals, reptiles and insects pose a threat to your life. Always go with a friend to the forest when you want to mount your camera. If you are two or more people, it means that there are more eyes and ears to detect danger on time. Furthermore, there will be more hands and guns to defend yourselves from a hungry predator. You also won’t get lost easily since if your GPS unit malfunctions, you can use the one carried by your partner. A camouflage casing doesn’t make the gadget invisible. It just makes it blend in the surrounding thus making it difficult to see especially if you are not keen. Such a gadget doesn’t attract suspicious animals. However, take the x,y coordinates of the area so that you can locate the gadget with ease when you visit the site after some time. Carry a backpack with a small tent, spare clothing, matchbox, raincoat, knife, water bottle, cellphone, and a spare battery or power bank for your phone. This kit is important if the forest is located in a remote area and you intend to set up a camp for a few days. The tent can provide you with shelter during cold nights and when it is raining. Build your tent on a location that is far away from animal paths. Keep the fire lighting at night to scare deadly animals and to provide you with warmth. The water bottle will provide you with clean drinking water during hot days. Always call the forest guards or your family to let them know if you are safe every morning and evening until your mission is complete. Many people ignore this important box since they don’t believe in accidents or injuries. However, you should carry this kit since it can be of help if an incident occurs. An animal can appear abruptly and attack you or your partner or you might cut yourself or even step on a sharp object. In worst cases, an individual can get bitten by a snake or a poisonous spider. These things occur in real life and those who happen to have an emergency kit don’t suffer. The kit can help you stop excessive bleeding, stop the infection and reduce pain if it contains painkillers. Stop what you are doing and head back to civilization if you or your partner is injured. Don’t assume that it is a mere bruise unless you are a doctor. Call the guards or an ambulance to get help immediately. Most wild animals like rubbing their bodies on tree barks during hot afternoons. Members of the cat family such as lions and leopards urinate on tree trunks to mark boundaries. Some herbivores chew tree barks during dry seasons to supplement their diet. Therefore, the camera can get destroyed by wild animals if it is mounted too close to the ground. Furthermore, the camera uses infrared technology. Unfortunately, most nocturnal animals have better eyesight than humans and they can detect the infrared flash from the camera. If the camera is positioned higher, the chances of spooking the animal reduce significantly. Some cameras take time to detect motion and take a photo. This means that if an animal was on the move, your camera might miss to capture it. A wide field of view also allows you to see a large number of animals in case they are moving in a group. In addition, you can see more animal activities such as fighting, and mating. You can also tell if the animals are relaxed or if they have detected your gadget. Most animals hide during daytime to avoid being attacked by hungry predators. Experienced adults move to places where there are many hideouts and no human intrusion. You can follow animal trails into such hideouts and mount your gadget. Limit your movement in such areas. 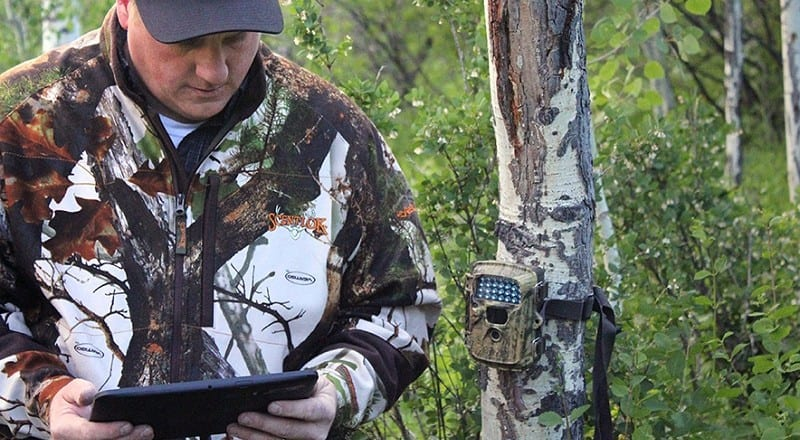 Use high-quality trail cameras especially those with long-lasting battery life and wireless connectivity to understand how the animals operate. When you do this, you can successfully hunt mature animals. If you are a deer or moose hunter, you can increase your chances of harvesting an animal if you carry out your hunting during mating season. During moose rut, you will be able to see hundreds of mature male and female animals. This prevents you from harvesting immature animals or pregnant ones. During excess rain, animals move to higher grounds to avoid floods. Dry seasons force the animals to migrate closer to river banks and permanent swamps. It will be pointless to mount a camera where there is no grass or water. If you can’t see anything within a week, change the location of your camera. Probably you positioned it close to predators which scare away your target animal. The animals could also have sensed your odor and they are avoiding the area. Another reason could be the animals have migrated to the other side of the forest which is greener with water in plenty. After learning the behavior of the animal, you can now hunt the animal. Check the winds to ensure that you stay downwind. This ensures that your odor is not carried by winds towards the animals. In addition, wear camouflage clothing, boots to make you blend in the forest. People can damage or steal your gadget if you mount it close to a footpath or a road. Position your gadget in a remote area or even in a thicket to keep it out of sight. Someone might vandalize your gadget due to envy or hate. Add a sticker to the gadget with a warning to scare such people. You might consider using a trail camera with a GPS tracker to locate its position when it disappears. Advanced models have password protection feature which ensures that your snapshots and videos are safe even if the gadget is stolen. This feature protects your work from being stolen especially if you are carrying out educational or scientific research which should be original with unique photos. A trail camera is a perfect gadget for hunting and carrying out a research on nocturnal wild animals. There are various designs which vary in terms of size and features. Best models have multiple video recording and photo settings and long battery life. It is recommended that you choose a model that has a camouflage setting since the chances of an animal noticing a new object in its habitat are minimal. 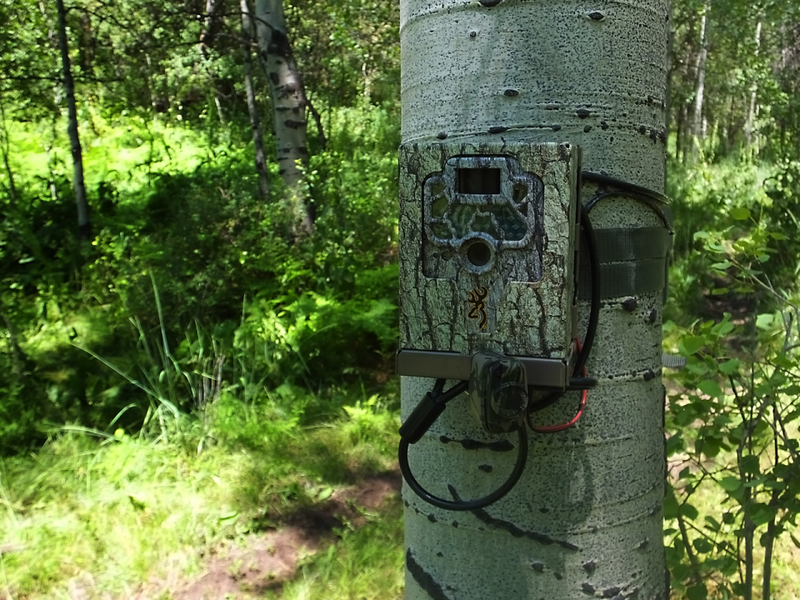 When setting up a trail camera in the wilderness, position it on a tree trunk to prevent animals from damaging it. Also install it when animals are absent so that they don’t become suspicious. Furthermore, don’t go to the forest alone since you will be in great danger if you get injured or attacked by a wild animal. Finally, get the necessary papers before hunting or studying wild animals to avoid getting on the wrong side of the law.